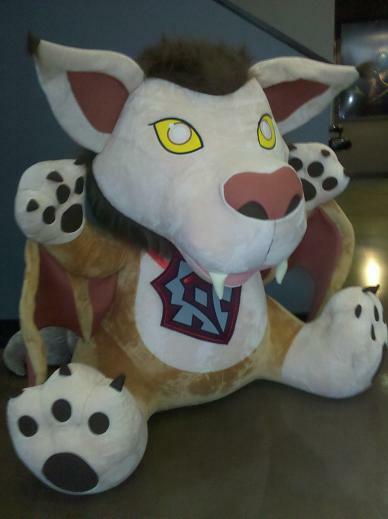 Do you want to buy these giant World of Warcraft plushies? Too bad, you can't! 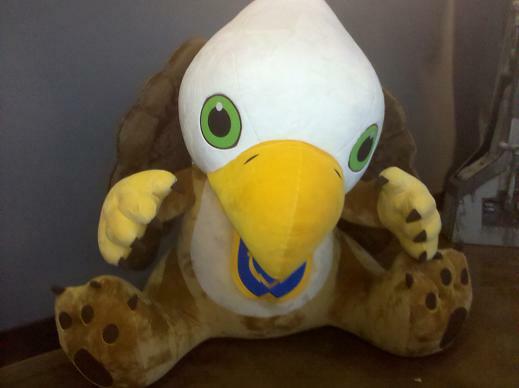 When Blizzard sent us a pair of the huggably adorable Gryphon and Wind Rider WoW plushies earlier this year, I didn't see how they could get any cuter. I still don't think they can get any cuter, but getting bigger is another story entirely. I had a chance to drop by Blizzard's Irvine, California-based HQ last week in advance of BlizzCon 2010. Lo and behold, I was greeted at the reception desk by these giant-sized versions of the plushies that are currently adorning my desk here at work. Though it's a bit difficult to get a sense of scale in my hastily-snapped pictures, these full-scale plushies are about 3-4 feet tall and made with lots and lots of love. Sadly, my inquiries as to where one could acquire these giant bundles of cute were fruitless. As far as I can tell, there's no place to get them anywhere - so unless you're planning on breaking into Blizzard's HQ and stealing them for yourself, you're out of luck. Not that we here at The Escapist would ever condone such a thing, of course. That is, unless you sent us whichever one you weren't keeping for yourself. Just sayin'.